An eye-catching triple flame aquashaped design in which the front flames in black granite and delicately shaded Botticino marble are backed by an oversized starfire flame. The balance of complementary geometries, textures and colors provides a variety of possibilities for artwork presentation, especially where artwork and text naturally follow the curvatures of the components. Second position etch optional. One colorfill included. What will my award look like? When will I see my proof? Your free art proofs will be sent to you within 48 business hours. Rush orders will receive art proofs within 24 business hours. Production begins after art proof approval. Then it is simply production time plus shipping time. RUSH service is available on many of our awards. Absolutely! Our awards specialist are standing by at 1-800-4-AWARDS (1-800-429-2737). We will be happy to to answer all your questions and walk you through your whole awards buying experience. Awards.com is owned and operated by Successories, Inc.
Succesories works with many suppliers and factories each vetted for high quality materials, product selection, and manufacturing capabilities to offer you the best, most innovated, and widest selection of products available. Although Successories doesn't own the end-to-end process of all products sold, Successories ensures that all products sold meet all applicable federal safety requirements as enforced by the U.S. Food and Drug Administration, the Consumer Product Safety Commission, and the Federal Communications Commission. A custom FREE Art Proof will be produced in 24 - 72 hrs for your review & approval. Our expert awards artist will make it look spectacular! Below are some examples of dedications you might engrave on your awards. We've broken them down by industry to make it easier to find the type of award you might be giving. Just click on the industry name below and start browsing! recent promotion to the team! 3rd Brigade Combat team, 101st Airborne Div. with the quality of your actions. to RWX Financial Services, Ltd. There should be no linked or embeded objects in your file. RUSH Service - Get your awards fast! Move to the front of the line and have your awards produced and shipped in the necessary time to meet your in-hands date. Just sit back and relax. We've got you covered. 1. Select your awards, choose the rush option and appropriate expedited shipping method. 3. A FREE proof will we be processed within 24hrs for your approval. *You must approve your proofs in a timely manner. If we are not confident that we can get your order to you with accuracy and quality in the time provided, we will suggest other options. An Awards Specialist will be in touch with you by phone and/or email. 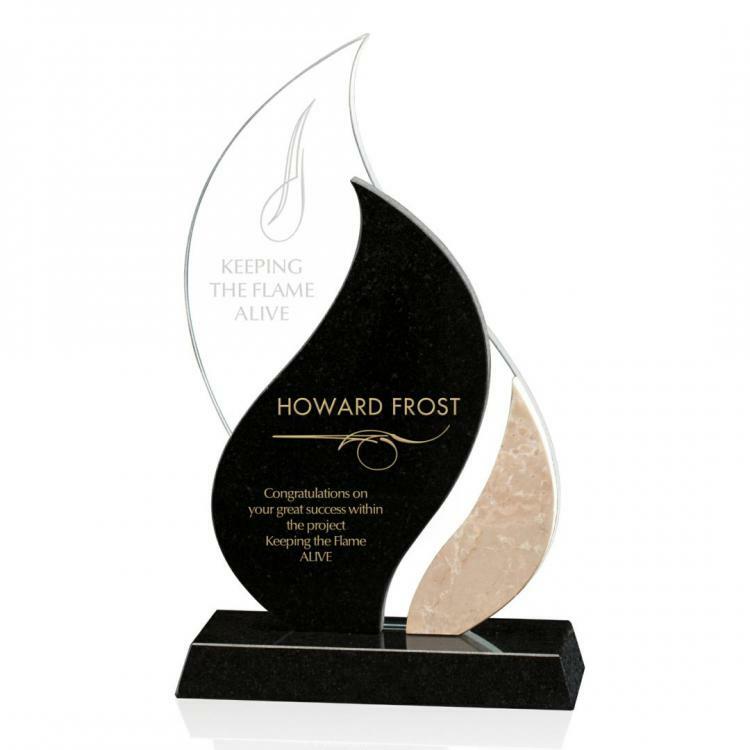 Skipping the proofing process allows production to begin on your awards immediately after you place the order. This is a great option when looking for a faster turn around and have a simple engraving. We do not recommend this option for awards with logos or long personalized messages. Waving the proof also waves all Awards.com guarantees. You are responsible for submitting engraving information clearly, accurately and spelt correctly. You will be responsible for any and all replacements necessary to get your order right. If production time still exceed your in-hands date, an Awards Specialist will be in touch with you by phone and/or to discuss options such as Rush service or altenative products. Perfect for solid pops of color. This process doesn't allow for multiple colors to touch or blend together. Starting at $10 per color per award with stock colors. PMS Match is possible. 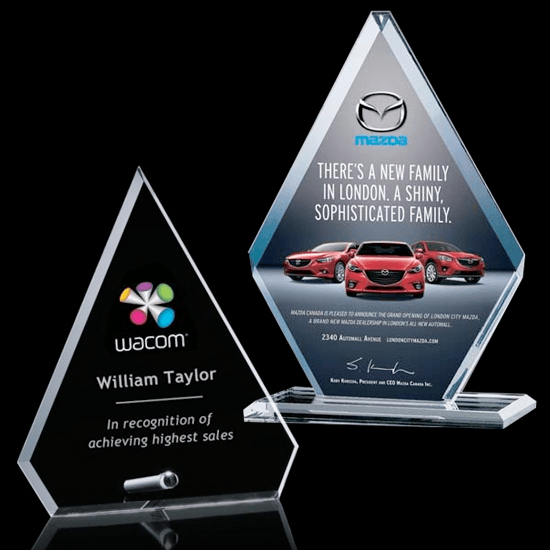 Perfect for adding a Picture or Complex Colored Logos to an award. This process can only be applied to awards that can lay flat horizontally. Starting at $10 per award. Turn nearly any object into a custom award. 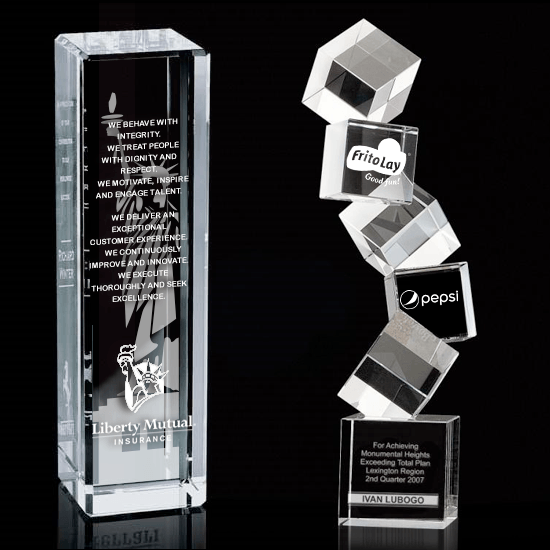 This process is only available on a small selection of thick and perfectly clear crystal awards. Onetime Art fees starting at $100. Perfect for adding more designs and dimension. Not all alwards can handle etching front and back. Consider thick crystal awards or multi-layered awards for this process. 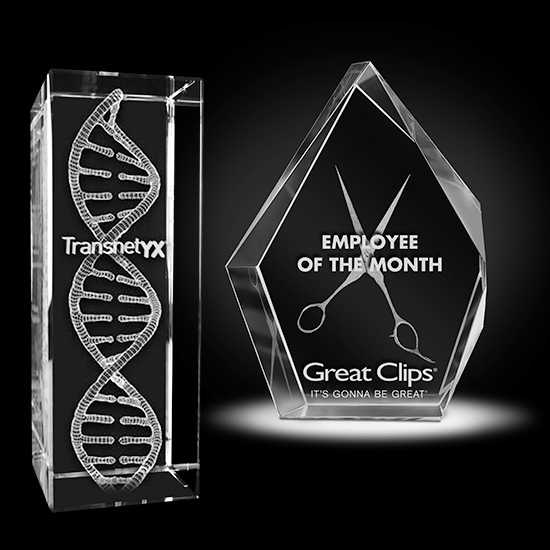 Starting at $10 per additional etch location per award. Looking for a thematic element for your award? Our Awards are blank, so etching a golf ball transforms a stock trophy into a Custom Golf Award. Our artists have access to a full library of design elements. Onetime Art fees starting at $25. 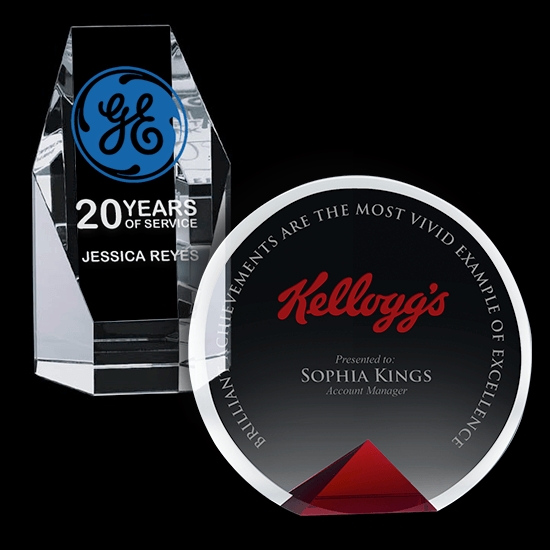 Some Award items do require additional production work prior to shipping. 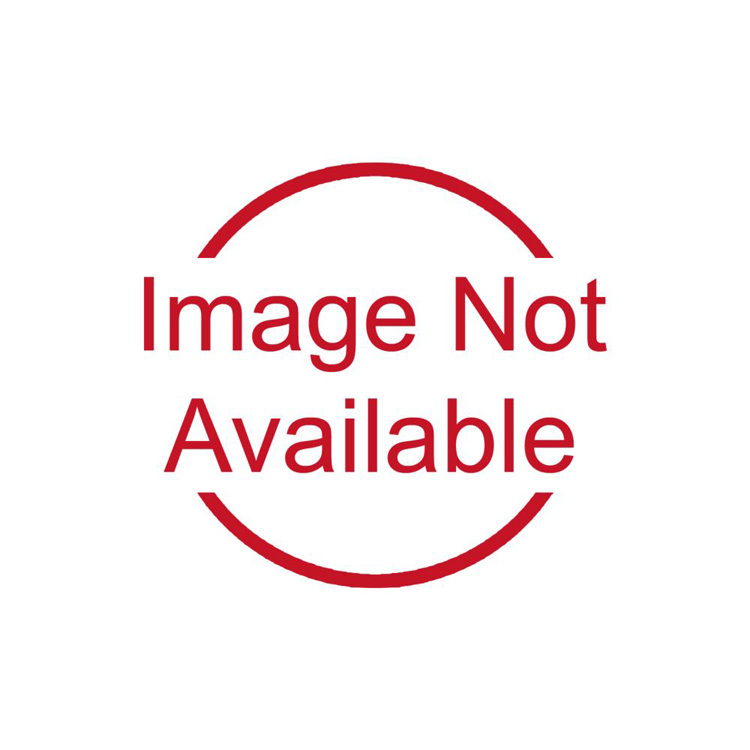 Any setup fees that are charged for an item will be displayed prominently in this area of the product detail page, as well as in your cart and during checkout. You will be charged only one setup fee for all products that undergo the same setup process. If the published price of this item on Awards.com drops within 30 days of a purchase, we will refund you the difference. It's that simple! Note: Items purchased through specific promotions, bundling arrangements, or coupons are not eligible for the Lowest Price Guarantee.